D. Nicole “Nikki” Guntner earned her J.D. from New York University School of Law in 2015. During law school, she served as staff editor for the Journal of Law and Business. Prior to receiving her law degree, Nikki earned her M.S. in Applied American Politics and Policy from Florida State University in 2012 and her B.S. in Political Science from Florida State University in 2011. 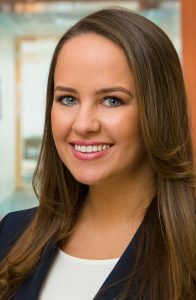 Nikki focuses her practice on pharmaceutical and products liability mass tort litigation. She is currently working on the national MDLs (multidistrict litigations) for 3M Combat Arms military earplugs and Proton Pump Inhibitors, or PPIs. Nikki served on the trial team for a Xarelto bellwether trial in Pennsylvania state court and was heavily involved in the firm’s efforts in the Xarelto MDL, which resulted in a $775 Million settlement. Before joining AWKO, Nikki worked as an associate attorney at Willkie Farr & Gallagher in New York, where her practice focused on commercial litigation and government investigations involving financial institutions. During that time, Nikki was seconded to temporarily serve as litigation counsel for Royal Bank of Canada, where she supported the Bank’s U.S. Capital Markets business in civil litigation and government investigations. Nikki maintains an active pro bono practice in which she has filed amicus briefs in the United States Supreme Court, circuit courts, and district courts on immigration issues and assisted victims of Hurricane Sandy in obtaining relief from FEMA to assist in rebuilding their homes.